1793 was a hectic year for the infant United States Mint. While only copper was coined, no less than three distinct types of cents were produced. All featured busts of Liberty, the first two being paired with a circle of chain links and a wreath, respectively. With the hiring of Joseph Wright, the Mint's first skilled engraver, a new bust of Liberty debuted in September. This featured a right-facing portrait of the young goddess, a staff resting over her shoulder. Atop of this staff was a conical cap of the type associated with freed slaves in ancient Rome. This obverse type was used in conjunction with a wreath of simpler style than that employed previously. This same basic design lasted through mid-1796, though several distinct styles are noted. Following Wright's premature death in the Yellow Fever epidemic of 1793, his original bust was modified early the next year by his successor, Robert Scot. John Smith Gardner is traditionally credited with a further modification made toward the end of 1794. This final rendition of the Liberty Cap obverse lasted through the end of this type in April of 1796. Wright's Liberty is known as the Head of '93, Scot's as the Head of '94, and Gardner's interpretation is called the Head of '95. Subtle changes were made to the reverse of this coin type, too, but these are of interest only to series specialists. A truly complete type set of United States coins will include all three editions of the Liberty Cap cent. Each has its peculiarities, and I'll attempt to describe these in brief. The Head of '93 cents are scarce in any grade, with well-preserved examples being genuinely rare. Wright's Liberty was in very high relief overall, yet her hair and facial features were unusually delicate. While both beaded and denticulated borders were employed with this type, neither was able to protect these coins from the ravages of circulation. When combined with the impure and often porous copper planchets used at that time, the result was coins that deteriorated quickly and are seldom found in desirable condition. The Head of '93 cents are by far the most challenging of this overall type to find in collectable condition. More than 40 varieties are known of the Head of '94 cents, all of them dated 1794. There are both common and rare varieties, so the type collector has many coins from which to choose. Though still in high relief, Liberty's portrait is more evenly wrought than on the previous issue. Planchet quality varies, with choice surfaces being scarce but obtainable for a premium. Patience will be rewarded when searching for a coin of this style. In addition to seeking a good planchet, look for a sharp strike and unimpaired surfaces. Many early cents have been cleaned and recolored; when done skillfully this is not a deterrent, but some coins may have an unnatural appearance. A good method for determining what is considered acceptable by collectors is to examine large cents certified by the major grading services such as NGC. 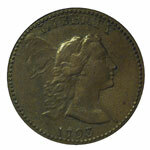 The Head of '95 cents include the final varieties dated 1794 and all of those dated 1795-96. The Gardner bust is characterized by an overall lower relief that enhanced die life, an important consideration given the great amount of handwork that went into finishing each die. Cents of this type are known with both lettered and plain edges, reflecting a change in weight from 208 grains to 168 grains; the thinner coins simply could not accommodate the edge lettering. The planchets used for these cents varied dramatically in quality. For this and other reasons, the striking sharpness of Gardner's cents is across the board. While the plain edge cents dated 1795 are the most plentiful of this style, finding just the right coin for a type set will still be challenging. On the plus side, these are typically the least expensive Liberty Cap cents, though there are some scarce varieties.